A Carlsbad man was arrested Wednesday after wrecking into a light pole on North First Street while driving under the influence and resisting officers in the aftermath. 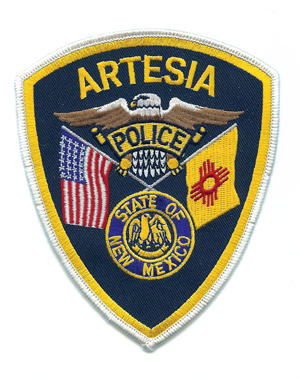 Artesia Police Department officers were dispatched Wednesday to the 300 block of North First Street in reference to a single-vehicle accident. The reporting party advised dispatch the vehicle in question appeared to have tried to leave the scene. Upon arrival, officers found a red 1999 Chevrolet Camaro facing east in the center median after having struck a light pole. The driver was standing outside and informed police he had been travelling south on First when a vehicle sideswiped him, causing him to lose control and strike the pole. According to the criminal complaint, officers said the man, identified as Brian Y. McIntire, 33, of Carlsbad, stated he did not see the vehicle that sideswiped him and could give no description. Officers also said McIntire’s speech appeared slurred, and they could smell an odor of alcohol emanating from his person. Police proceeded to administer a field sobriety test. After failing two of the tests, the report states McIntire was asked if he wished to continue, and he requested to be taken to jail. He was placed in handcuffs, and as an officer was escorting him to a patrol unit, the complaint states McIntire began to push back onto the officer, trying to turn. He was subsequently placed on the ground but would not calm. After being picked up and escorted again, McIntire continued to resist and would not sit down in the vehicle, having to be pulled from the opposite side. The report states McIntire began talking and would not listen as officers read him the implied consent information for a blood draw. During transport to the Artesia Detention Center, officers asked him again if he was sure he needed to medical attention in the wake of the accident. McIntire had refused treatment when police arrived on scene but now stated he needed treatment due to the way he was placed on the ground by officers. McIntire once again began attempting to resist as officers escorted him to a hospital room at Artesia General. He was placed against a wall and asked to comply so that medical professionals could be allowed into the room. The report states that after some time, he did as instructed, but after being medically cleared, he began to push against and pull away from officers once more while being escorted back to a patrol unit. Once at the unit, the complaint states police began to perform a routine search of McIntire’s person, which had not been performed on scene due to his resistive behavior. During the search, McIntire reportedly spit into one officer’s mouth and refused to re-enter the unit, having again to be pulled in from the opposite side. McIntire continued to be uncooperative after reaching the detention center and was placed in a padded cell. Officers meanwhile were able to speak to a witness of the accident, who informed police he saw the Camaro lose control, enter the median, and collide with the light pole. The witness did not see any other vehicle around the Camaro at the time of the wreck. McIntire was subsequently charged with aggravated driving while under the influence (first offense), resisting, evading or obstructing an officer, and battery upon a peace officer. He is scheduled for a 1 p.m. Jan. 2, 2019, preliminary examination before incoming Judge Jimmy C. Foster in Artesia Magistrate Court.